These inspections involve a qualified technician checking your house ( inside, subfloor and ceiling) and surrounds ( yard, sheds, fences etc ) for building defects or problems. While we are qualified to carry out both building and pest inspections, we recommend that you use two specialists trades people which should give you a better report as you will have a specialist builder doing the building report and we can do a specialist pest report. In your pest report we will comment on timber decay, borers, current termite activity, old activity and potential risk areas for termite entry. We do have contacts to do a professional building report for you in the Wollongong and Southern Highland areas. We also offer you the option of our trained termite detection dog and the use of our Thermal Camera. A trained termite detection dog can be 98% accurate compared to a trained pest inspector doing a visual inspection only being about 40% accurate. You may wonder why there is such a difference. It is because a majority of houses have termite entry points that are not visible, we also can not see through walls and when you get in the roof it is very restricted for space and often has insulation covering a lot of the areas we need to inspect, yet our dog can smell them through the walls of the house. Termite detection dogs are trained the same way as Police and Customs dogs except that they are taught to detect the scent of live termites rather than the scent of an illicit substance. The initial training lasts for about 6 months for the dog once a suitable pup is selected, and ongoing training is performed daily for the rest of termite dogs working life. During the Timber Pest Inspection the inspector evaluates the conditions of the property and tries to eliminate anything that will compromise the detection of Termites for the dog, for example other animals, pet food, food scraps, air conditioners and ceiling fans etc. He will then bring the Termite Detection Dog to all accessible areas internally. If the dog picks up the odour of termites it will then try and locate the areas where the scent is the strongest and give a positive indication to the handler buy sitting and pointing to the location. If this occurs we will then use another tool called a Termatrac, this picks up movement through walls without being invasive. If this also indicates a positive reading for movement we would expect that termites are present and a termite management program would be quoted. 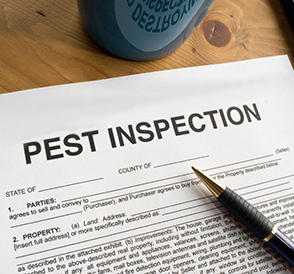 All our termite and timber pest inspection do still require the inspector to check the property to the Australian Standards applicable to each inspection. But for a small additional fee we can use the best tools available to us and double your odds on finding termites if they are present. Don’t pay for half a job this is your biggest investment so get it inspected properly.